Exciting news for Enfew visitors that we just started our first giveaway with Invoicera. Guys at Invoicera were very generous to giveaway 3 Preferred Subscriptions For 3 Months. Nobody likes creating invoices. They are a pain to create, to send, and to follow up on. But with the mounting influence of online applications, the number of online invoicing apps has boomed in the last couple of years and they keep getting better. Dealing with your invoices online also has the advantage of working from anywhere. One such Invoicing app is Invoicera. This invoicing app is really spectacular and clearly built with keeping the requirements of all types of businesses in mind. Let’s take a look at what The Invoicera can do for you and how you can get benefit from it. Entries after 10th June will not be accepted. Winners will get an email from Manish of Invoicera with details in it. What is Invoicera and what it can do for you? The Invoicera is an online billing and invoicing service offers an extremely streamlined service that can invoice, bill recurring and manage projects and items. This online application has been designed to meet the requirements of small businesses as well as big corporate. It offers a complete range of invoicing functionality ranging from great invoicing to effortless project time and expense tracking. With many useful features including sending invoices to multiple contacts, integration with Basecamp, time management, recurring invoicing etc., Invoicera is certainly worth checking out. It is one of the most beautiful invoicing apps we have come across and equally one of the simplest. The interface is divided up into nine main tabs; dashboard, Invoices, Reports, Projects, Items, Clients, Estimates and Expenses. Creating a new invoice is a breeze. Simply click on ‘add invoice’ link and fill in the details and new invoice will be created within few seconds. Invoicera will make it look clean and presentable by its self. It gives you a nice range of options when creating or editing invoices. Adding descriptions of charges is also not a problem, allowing you to add individual products and services, or a charge per hour. Referral Program: With Invoicera’s Referral Program, you can earn 25% recurring commission for life time by simply getting your friends or to your business contacts to sign up for the Invoicera’s paid subscription. Plans & Pricing – Invoicera has a very simple pricing structure. Their pricing plans are awesome and definitely within even the smallest of small business budgets. The pricing seems fair, and when you boil the price down even the Basic account is only approx 30 cents per invoice provided you make full use of the plan. Conclusion – We have been very impressed with Invoicera’s ease of use, its efficiency and flair. The simple interface avoids the needless features which are more typical in desktop software, making it a feasible, easy to use solution for all types of businesses even with limited technical knowledge. It saves time and more importantly, any person can supervise their invoicing needs without the help of dedicated staff and technical expertise. This translates into savings in terms of fewer staff. If you need advanced functionality and ultimate flexibility, this is the app for you. Invoicera can help me out in my Future Projects that I am working on. It will make my invoicing tasks a lot easier and more accurate as I would be ably to track my expenses and time effectively with its astonishing expense and time tracking feature. I would love to win this one. 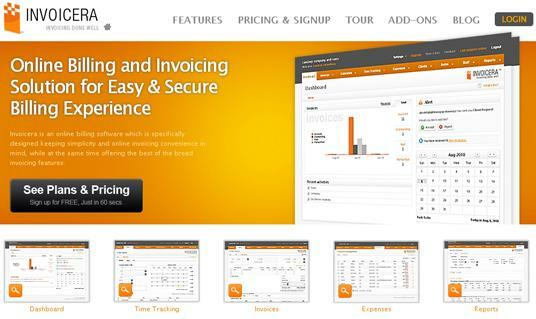 This is the most wonderful online invoicing app I have come across. Its user interface is simply awesome! great one for me to enhance my small business. thanks for this.